Been venturing to a lot of sushi places lately. 😛 But really Vancouver is full of them! This stop is Sushiholic. You will notice this little sushi place as you drive down Lougheed which turns into E Broadway cross street with Rupert, it will be on your right side. I live only less than 10 mins drive from this place, always pass by it and finally stopped and try it out. It is a small little place, it gets quite busy during dinner hours. We arrived sometime around 5:45pm, therefore no waiting. As we got seated I notice this place is run by Koreans, the decor is quite new and clean. Taking a look at the menu, this roll got my attention: Awesome roll. I wasn’t attracted by the name, I was attracted by the photo. You will see what I mean below. Oh yea, just by the look of it. It looks pretty awesome. Crab meat, avocado, cucumber, masago, baked salmon and super thin yam fries on top. 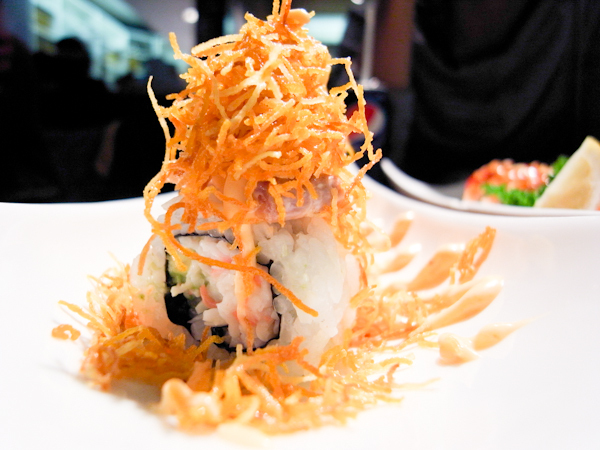 I really like the yam fries totally made the sushi so much better. As we all know many sushis are quite soft without much various types of textures. But these little yam fries give it the crisp and it was very yummy!! 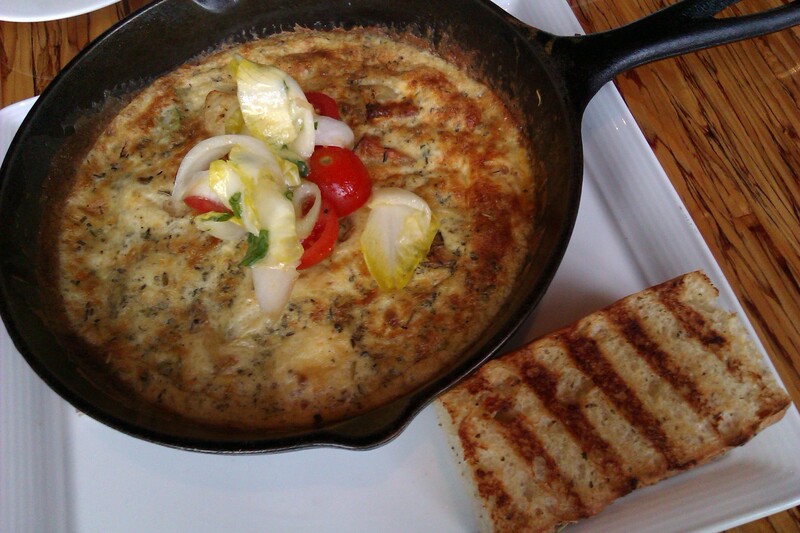 I really liked it, the flavours are right and the texture is great. Here is the rainbow roll, beautiful colors with six different kinds of fish on top with crab meat, avocado and cucumber inside. 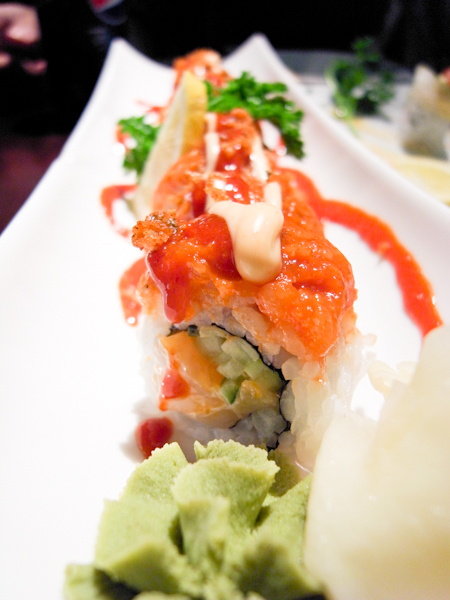 This roll is also very good, their raw fish is fresh. 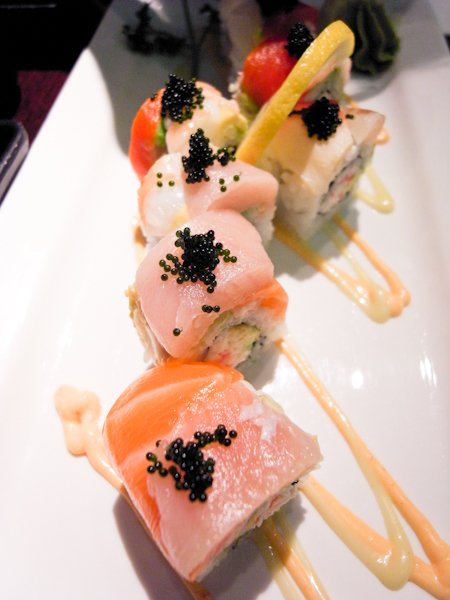 It is great if you want to try out different types of fish sushi without having three pieces of each. This will allow you to get a bit of everything. Planned a visit a while back but didn’t make it at the end, so I have made it finally!! 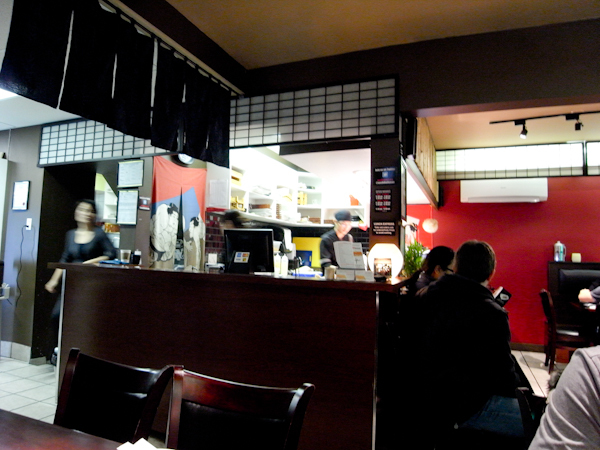 Sushimoto is right underneath of the Holdem Skytrain Station in Burnaby (Only 5 mins drive away from my place! :D). I went with a bunch of ex co-workers, the place is small/medium with very interesting decor. Full of Japanese action figures across the bar, with a rustic overall feeling. I absolutely loved it! 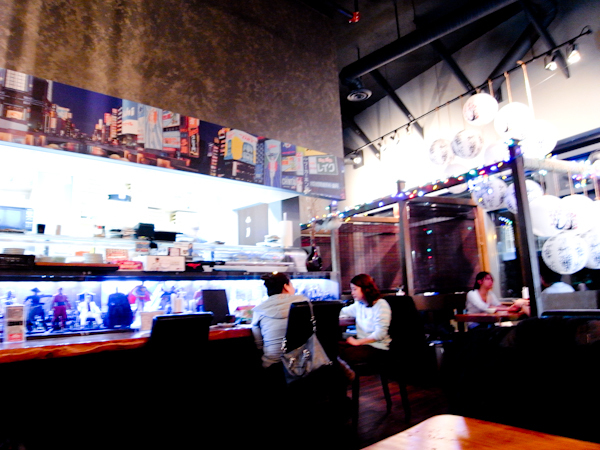 This little sushi place is ran by Koreans (judging from the staff), they are all very young. I felt like sashimi that day so I have ordered a chirashi-don (sashimi on sushi rice). My friends ordered assorted types of rolls and appetizers which pretty good (I had chipmunk bites from them). 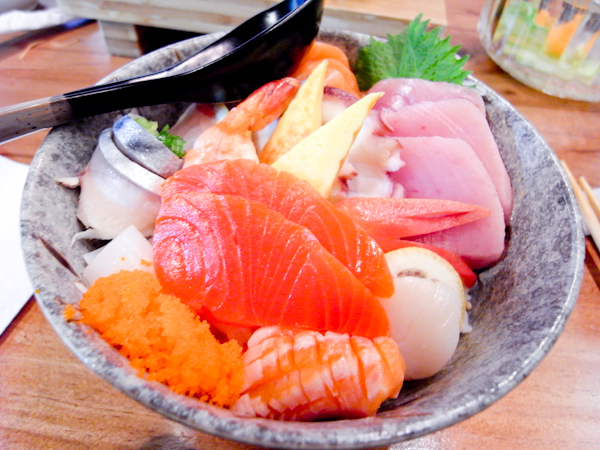 My chirashi-don was very good as well, the sashimi are very fresh. Was brought to the right tempeture before serving. 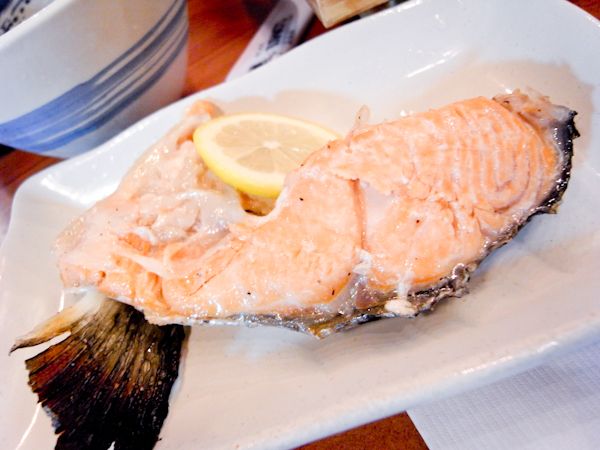 The kitchen kept giving us items on the house – spring rolls, grilled salmon (which was so nice and tender :9), salad. 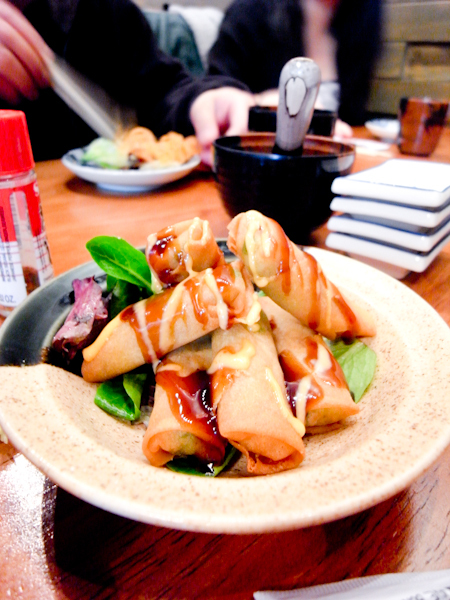 They were all very good, I especially liked the spring rolls. From a recommendation of a friend I decided to go and give it a try. I was crossing my fingers to not get anything that is going to be overly sweet that seems to be very common in Vancouver. Close to the Canada Place, we took a walk down from Robson. It was a nice day so it was a nice walk also. I was afraid I miss it since I am thinking in my head it will be a very small store. 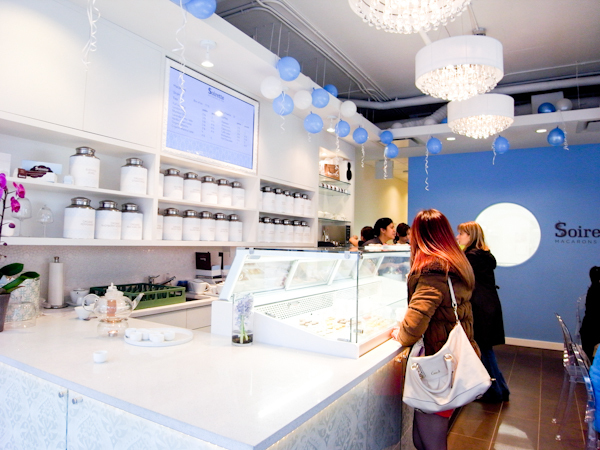 It is a very small store, but the decor is not be missed. I noticed it right away as I walked down the street, it’s the only cute little blue shop on the strip. I went and I loved the decor even more! So cute!! The place was fully packed! 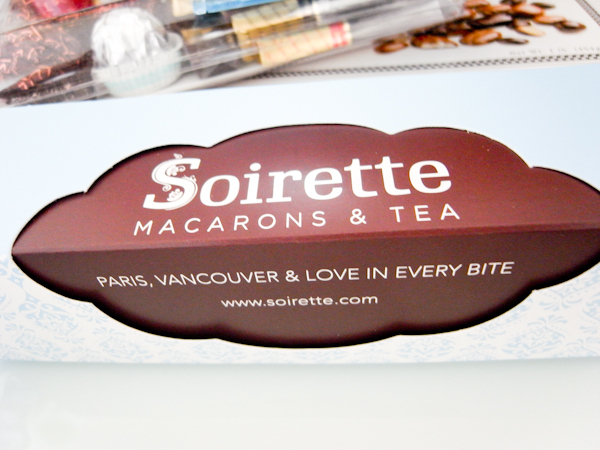 I was really hoping to finally sit down after the walk and enjoy a cup of tea latte and some macarons. So I had to order to go. The take out box was very adorable matching well with the interior decor. I was excited like a little girl as I open it at home, I felt like I was opening a present!! 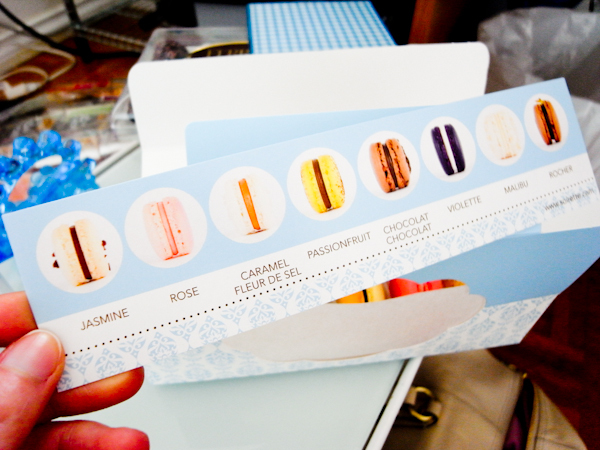 There is also a little card inside that explains about all the flavours. I have ordered the rose – so pretty in pink and comes with a very gentle scent. 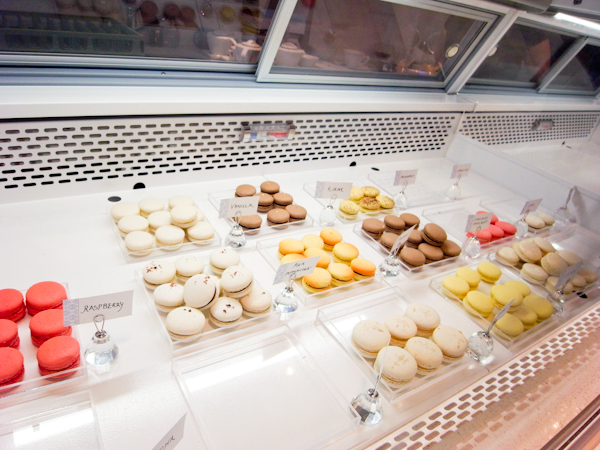 I also ask the very polite server to help me pick out a few good and popular ones such as lemon, malibu, vanilla, maple and passion fruit. I would have to say I really liked the lemon, very refreshing! 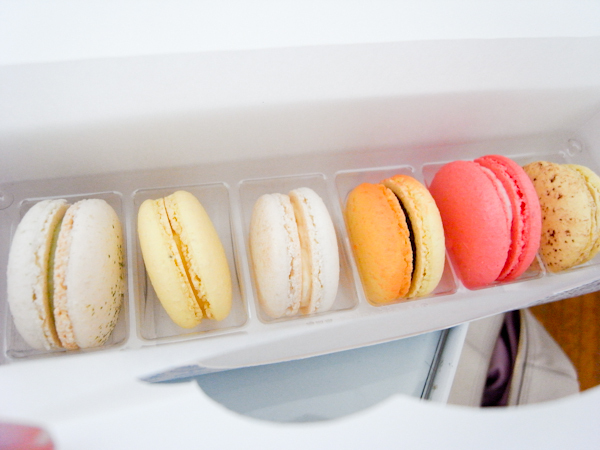 Overall this is the least sweet macarons I have tasted. My 2nd favourite would be the maple (was sweet but not unbearable) however the scent is great. If you have a spare weekend morning and don’t mind line ups, please do visit. (They take reservations during weekdays.) This cafe is famous and known to be the same ownership as Chambar next door. Been here before I came early to get a seat while waiting for my girlfriend. The line wasn’t too bad maybe because I came early (9:30am), I recall waiting for about 20mins or so. But I bumped into a friend so I had a chat while I waited. But it is worth the wait for a seat in their beautiful loft and their delicious food. 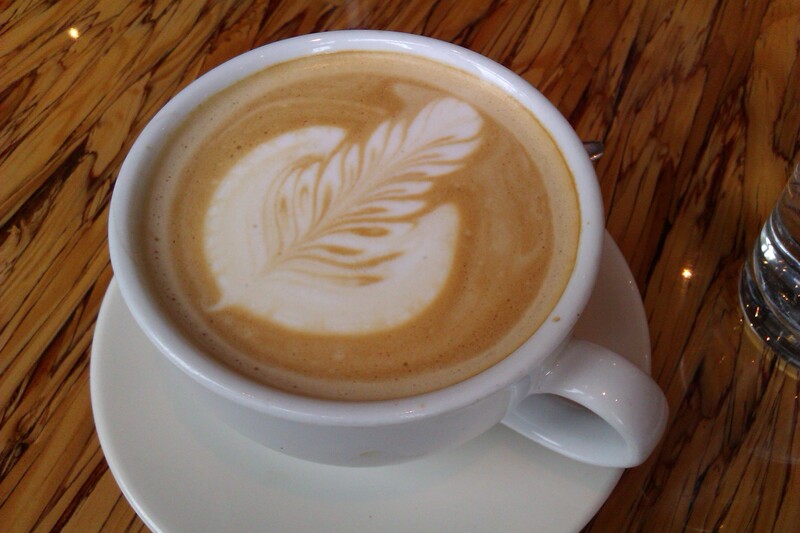 I tried out their raspberry latte last time, so I ordered it again. It has a nice sweet raspberry fragrant and I don’t have to ask for it to be less sweet. It was the right sweet for me. Their waffles are to died for, if you live around the neighbourhood. 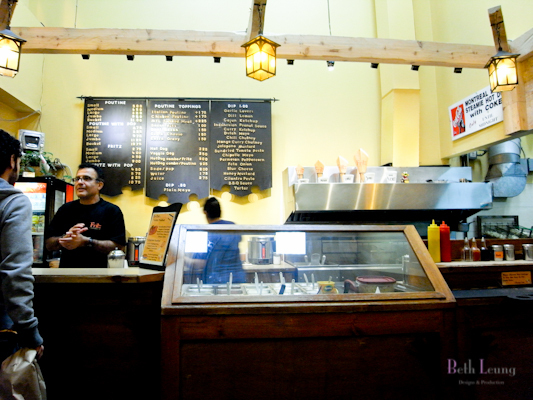 You can definitely pop by for waffles take out, they only have limited amount everyday, so go early! They have variety of dips to choose from, depending on your mood. 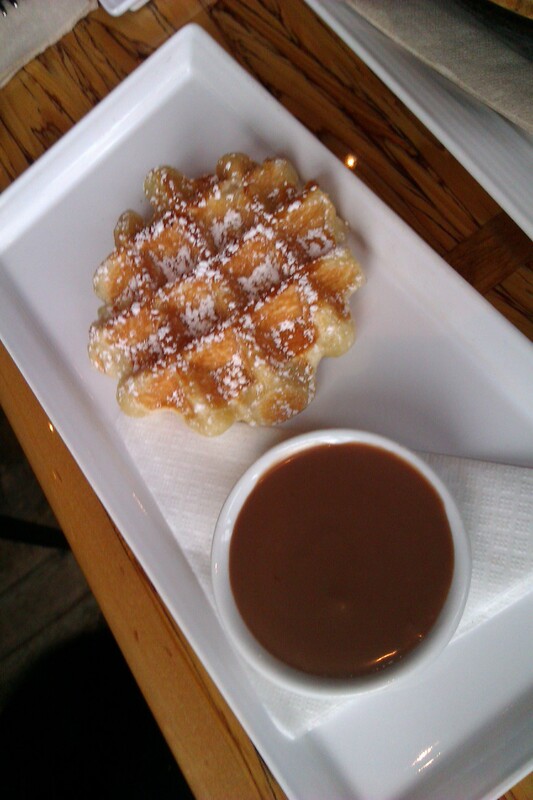 But their waffles are the right amount of softness and chewiness. Yes chewy. 🙂 I have tried out many waffles that are very nice and fluffy, but this one is really really good! It has to be favourite in the whole lower mainland right now. 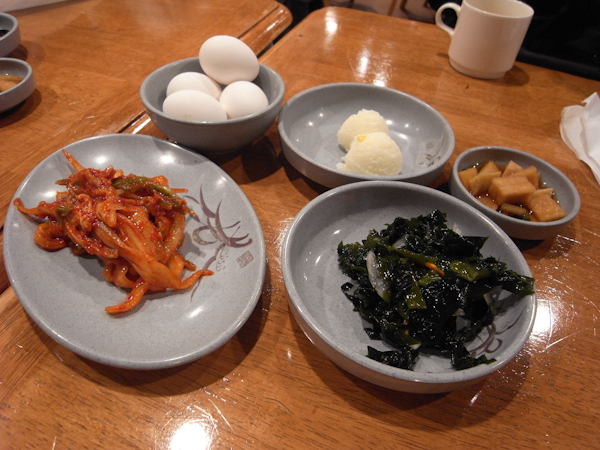 Too bad it is really far from where I live, otherwise it will be a nice easy take out breakfast for me. 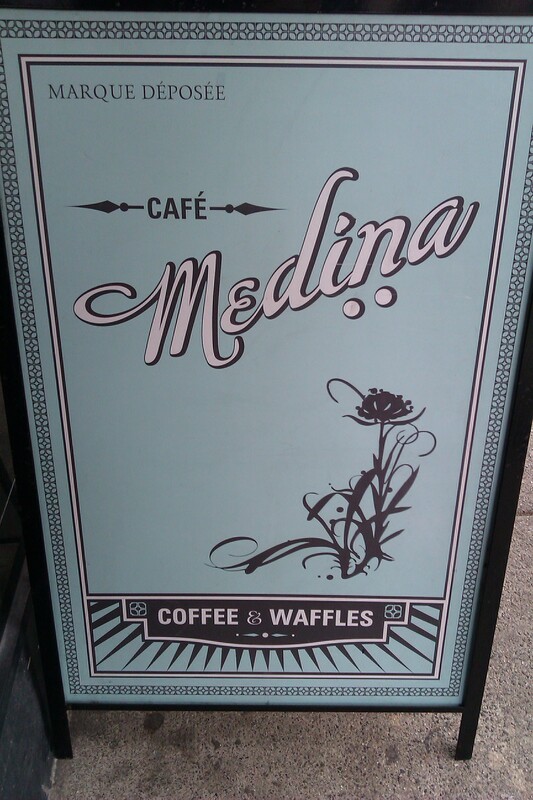 They have short operation hours, so be sure to check out their hours before visiting @ Medina Cafe. 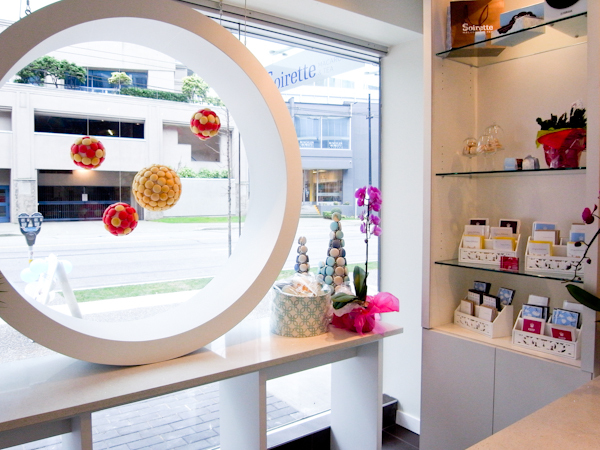 Notice this place every time you pass by on Davie Street in Yaletown? From the outside, this little European looking fry shop always caught my attention. I never actually went in until a friend recommend it to me. So I went down with a couple of friends before a Halloween downtown mystery tour. Fritz at 718 Davie Street Downtown Vancouver, you will notice because it looks quite unique in the Yaletown area. So how does it all work? You pick size of fries you like and then you pick a dip. They have a large collection of drip to choose from. I would suggest if you go with friends you can order a jumbo size fry and few dips to taste. There isn’t much seating areas, so a group no larger than 4 would be great. One thing I found quite interesting is the furniture, because they are designed to let their cones of fry sit perfectly in the table and chair arms. 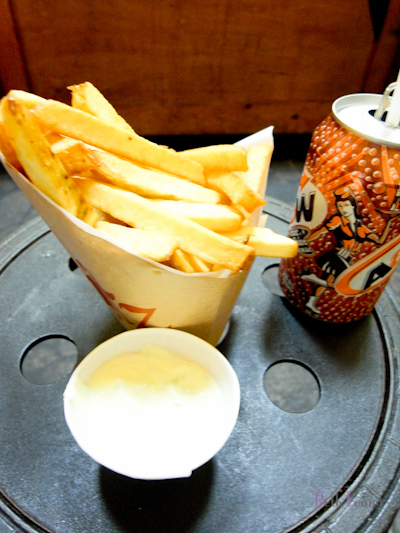 As you can see from the photo, you can put up to 5 dips around the fries! 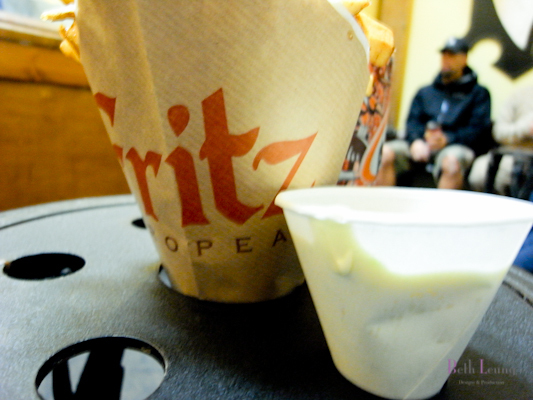 🙂 We got a Jalapeno Mustard dip with our fries, so strong jalapeno! 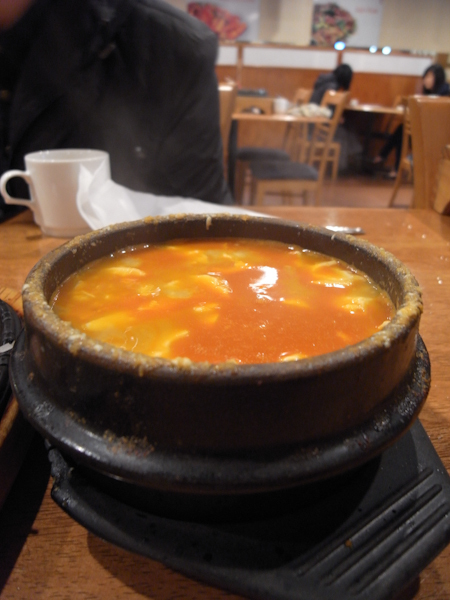 But wasn’t too spicy, just a great kick of scent, I really enjoyed the dip. We also got a chicken poutine, very good as well. 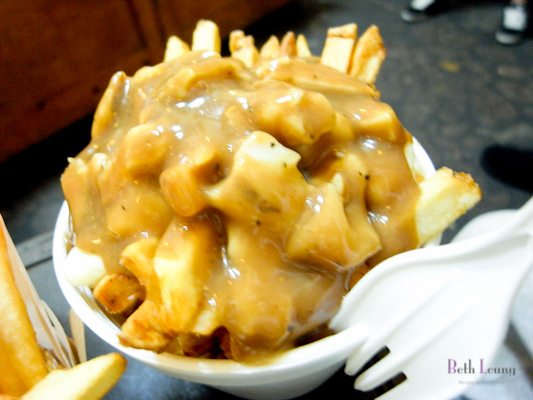 The gravy was quite salty, but overall a yummy poutine. But I know a lot of good poutine places in Vancouver as well.